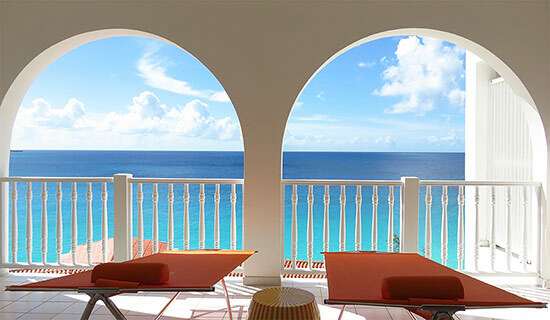 One of the most beautiful luxury hotels in Anguilla, Malliouhana is Caribbean elegance at its very best. A small, calm and very private property, tranquility rules supreme at Malliouhana. 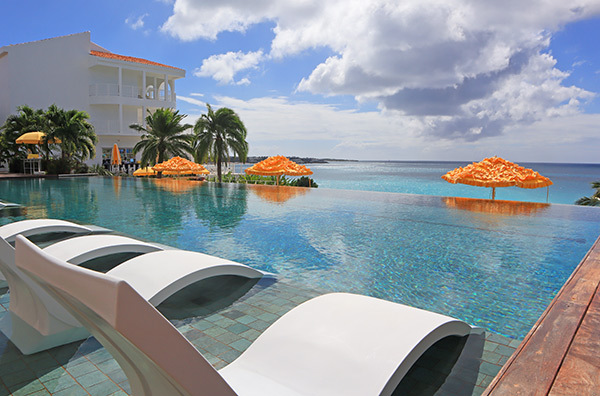 The luxury hotel boasts two infinity edge pools that overlook Anguilla blue. Prefer the beach? 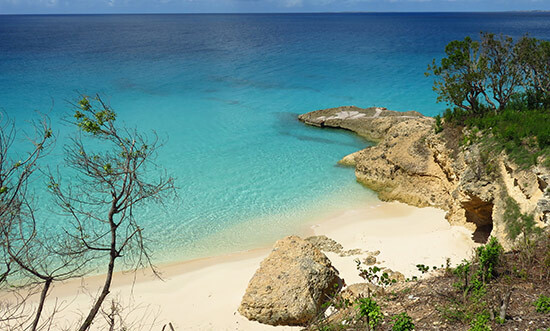 Two of Anguilla's most spectacular hidden coves are located on-site. Malliouhana. 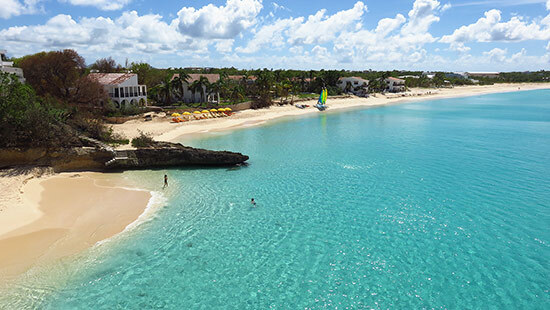 It was the resort that inspired white-sand Anguillian dreams in the minds of travelers when it opened back in the 1980s. A benchmark for impeccable service and classic-Caribbean design, it set the pace for luxury Caribbean travel for twenty years. The resort closed its doors back in 2012, but re-opened in November 2014. Today, it is owned by the widely loved Auberge Resorts, which has sister properties in Oregon, California, Colorado and Mexico. 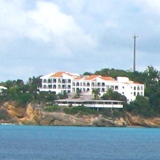 The question on the minds of many is Will Auberge Resorts be able to restore the "Grand Dame" to Meads Bay? Touring this re-make of a classic was loaded with anticipation. The crew certainly had their work cut out for them. Renovations began in mid-2012. 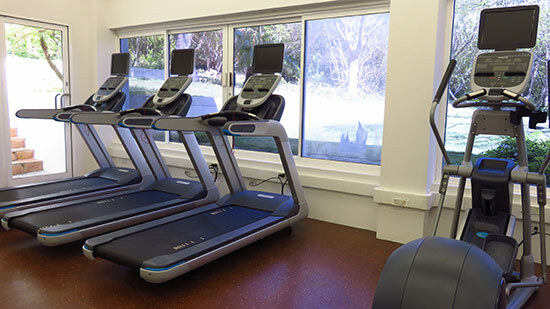 With total tear downs, repairs and re-touches, they have been working tirelessly since. All of that hard work has paid off. Auberge has taken the task well beyond a mere cleaning up of Malliouhana. 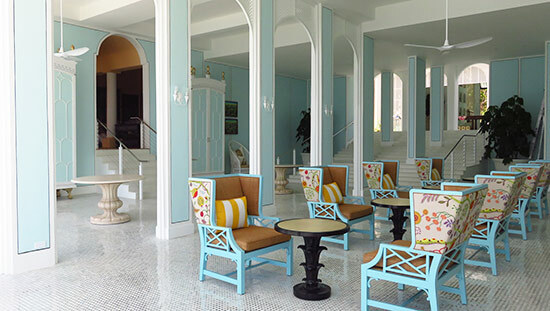 They have achieved a step back into the future with a Caribbean-esque Beverly Hills Hotel. How do you keep elements of the resort that guests held so dear and near to their heart and modernize without obliterating what came before? Walking through Malliouhana, Auberge Resorts shows us precisely how to do it. All elements work together to evoke a classic, luxurious feel. The main entrance opens onto a wide hall and then into a great room, the main lobby. Breezy, spacious and with the ocean just beyond, this room eases tensions and transports you into another world. Reception has been moved from the front of the hotel to a more private area. Behind curtains, staff awaits, to check you in and get you settled. 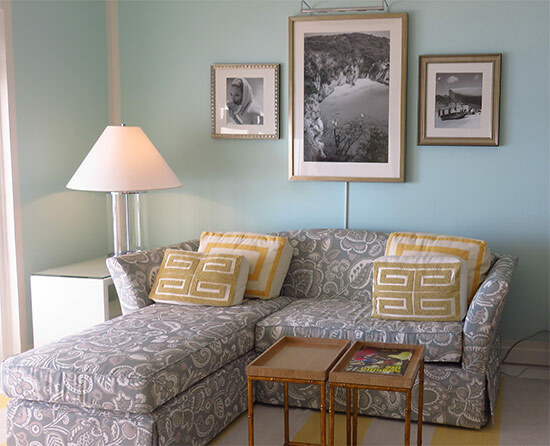 Comfortable and bright, there couldn't be a more peaceful way to begin your stay at Malliouhana, an Auberge Resort. 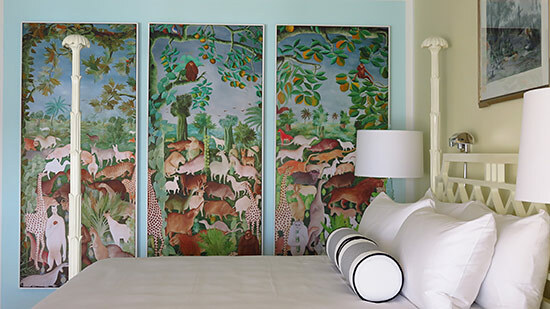 Auberge has retained most of the beloved Haitian art from the original Malliouhana, sensationally re-integrated into its new home. Beyond reception, there are lounge areas, both inside and out. 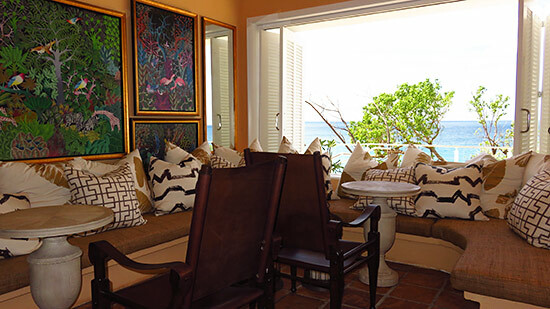 The classic feel, paired with the gentle color scheme, creates a light, dreamy Caribbean ambiance. 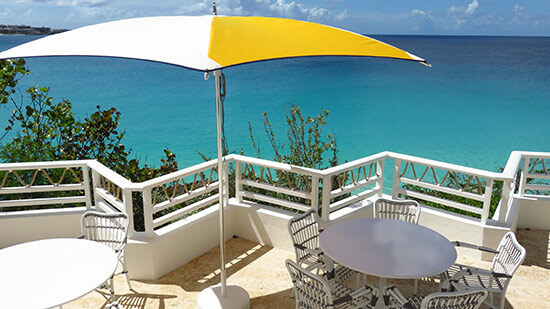 From its perch high on Meads Bay's eastern cliff, the views here are unparalleled. The exterior lounge spaces make optimal use of those panoramic vistas out to sea. Back inside the main lobby area and up a small staircase is the Sunset Bar. Modern and exotic, the scene somehow evokes feelings from an earlier, more romantic era. 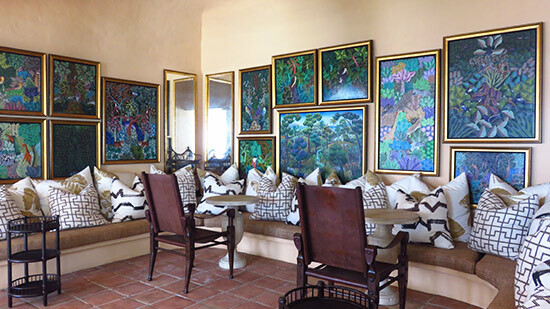 Intimate, with a warm color scheme, Haitian art adorns the walls. 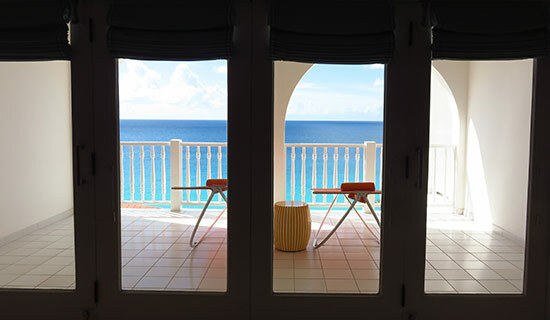 The sea-facing windows open through white shutters, delivering those views of which you never tire. 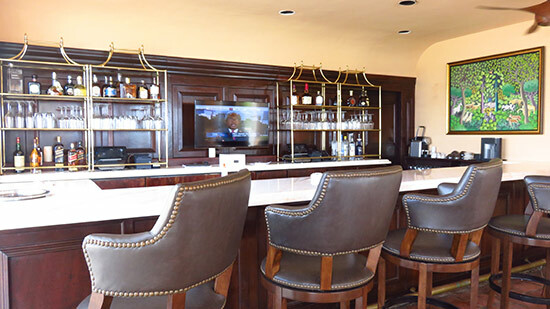 The original bar, a favorite gathering point of many, has been beautifully maintained, upgraded with icy-white counter tops and classic, brass-button bar stools. 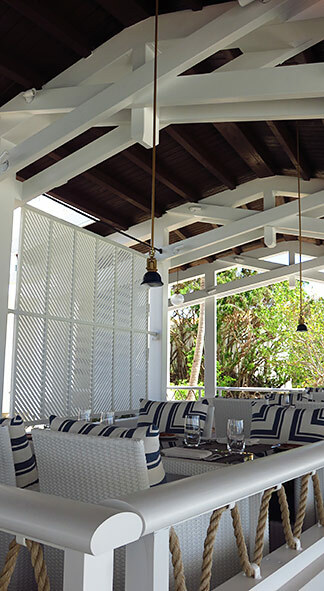 The bar retains its outdoor seating as it opens onto the pool area as it did before. This was our favorite spot for a sunset drink "back in the day (one of our early magic memories)." 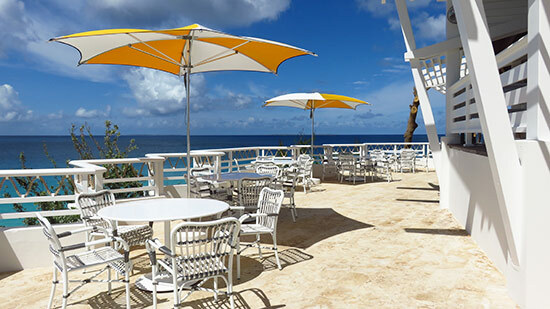 With the same endless views over the ocean and out to the horizon, it will soon regain its "top spot" status for sunset cocktails. Once outside and on the bar's terrace, the pool is perhaps the biggest change to the whole property. 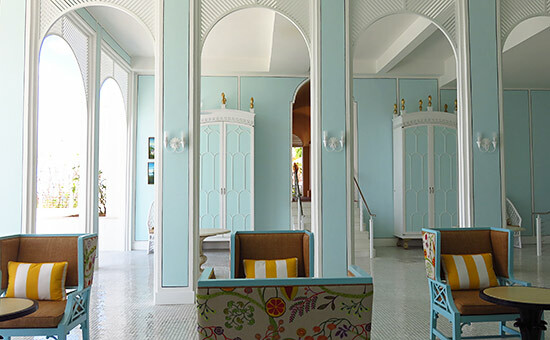 Anguilla meets Malliouhana meets Beverly Hills of the 1950s. Two infinity edge pools replace the original. A top-tier pool flows above a second one below. Both gaze out to the shining sea. This is not a scene to miss. 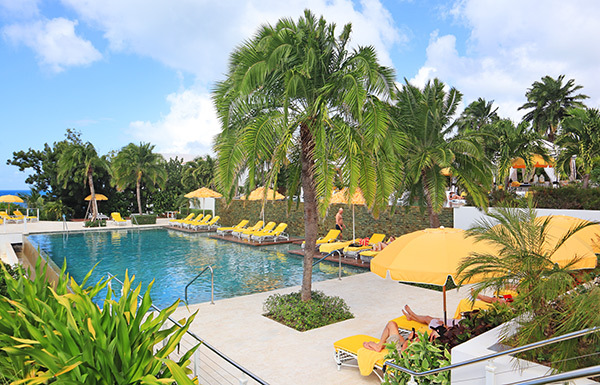 With oranges, yellows and whites making up the color and design motifs, the pool area has a distinctly 1950s-1960s feel, blending in with new and luxurious features. The lower level pool features sun loungers complete with wide umbrellas. Food and drinks can be ordered pool-side as well. The upper level pool maintains the same rule as ever. 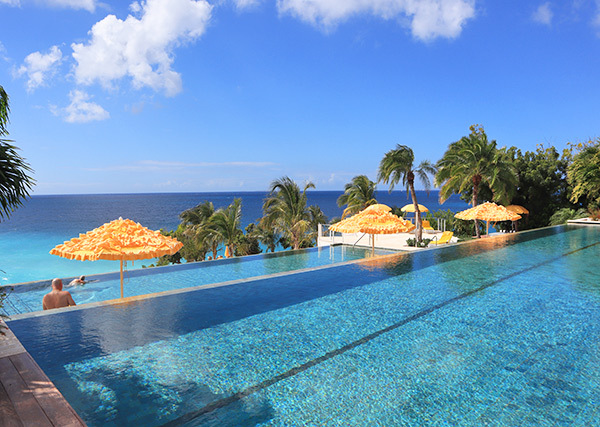 Malliouhana reserves the top pool area for adults only. Complete with cabanas, you can order drinks, meals and then, if you are so inclined, draw the curtains for a snooze. The resort has been graced with a little sandy cove virtually all their own. Few but Malliouhana guests find their way to this special spot. This beach is not Turtle Cove. That beach is further east on the resort's grounds. 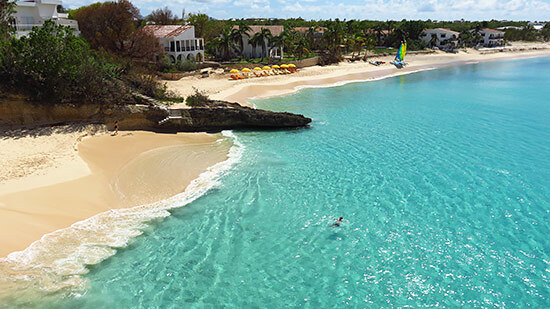 You can still walk down to Meads, one of the very best beaches in Anguilla. Or, take a dip in a little cove that has re-appeared in recent years. Meads Bay sure shines a unique hue of turquoise. That has not changed and never will. Next up on the tour? The rooms! Back inside the hotel and up a few flights of stairs, we were set to look at Malliouhana's Ocean View Deluxes. 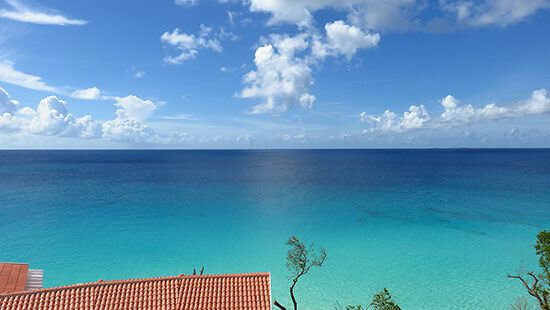 Malliouhana currently has 44 rooms and suites available. 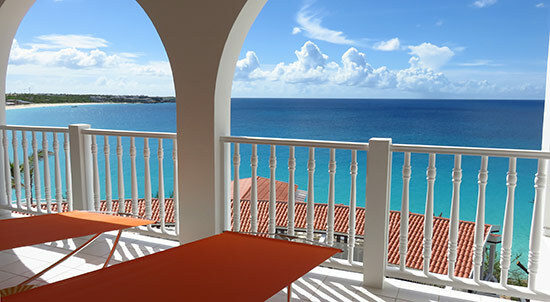 These include ocean view rooms in the main hotel area, ocean view and garden view rooms in the villas surrounding the central hotel space and junior and two-bedroom suites overlooking Turtle Cove. 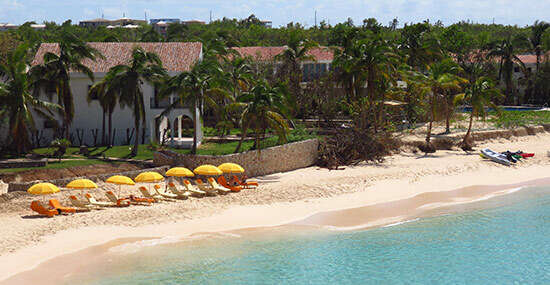 The larger villas on the Long Bay side and on Meads Bay were not part of their first phase of renovations (details to come). One step inside the door and now I know why these are called Ocean Views! 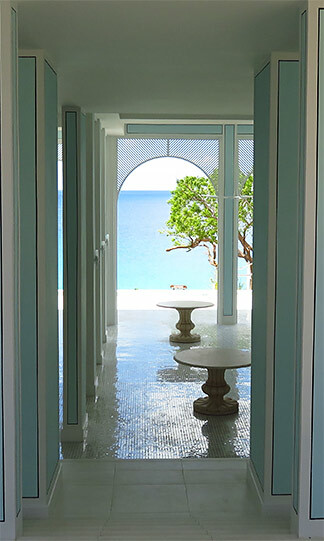 That crystal clear sea stares you down from the moment the door opens. Inside, the bathroom is to your left. The bathrooms have been completely gutted and re-done. 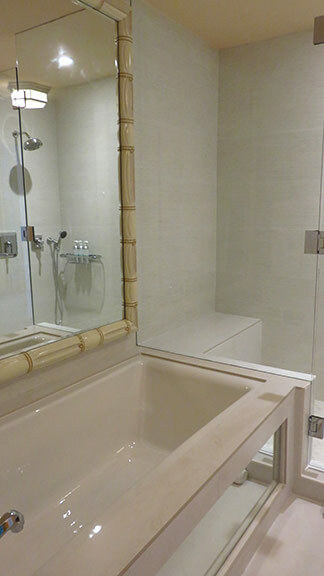 A large bamboo-framed mirror sits behind a sink tub. A walk-in shower meets the sink tub at its end. The toilet sits behind closed doors. And, there are two beautiful sinks and vanities. 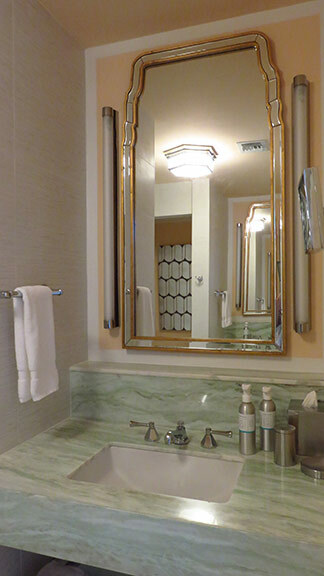 The vanities, with their light, sea-green marble and classic frames are particularly pretty. The rest of the bathroom is encased in a neutral marble, which is soothing. Across from the bathroom is closet space and a shelf with Nespresso machine. 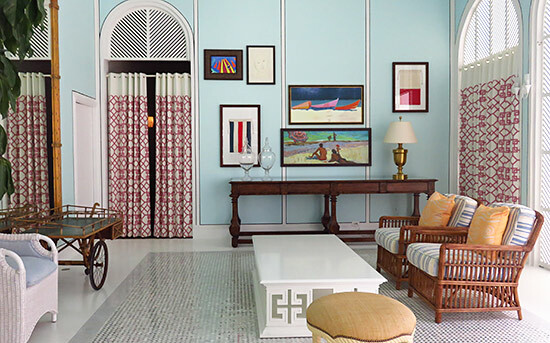 The "new classic" Malliouhana aesthetic carries through into the rooms. A comfortable king (or double queen) bed sits between two vanities with charming, coral lamps. 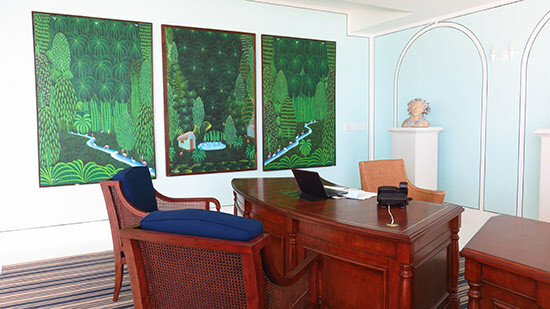 More vivid Haitian art, a calling card of the original Malliouhana, hangs on the back wall. The bed faces a large mirror. Recline as you point the television's remote control at the mirror and click "on." The television screen shines through the mirror. High-touch technology at its best. A modest table sits in front of the mirror and a cozy seating area is adjacent to the bed. What does it look out to? "Just another perfect view." That very shade of turquoise certainly has a hypnotic effect! Of the 800 square feet, the terrace area is indeed my favorite. You could gaze at those colors all day. And to the ear? Sheer bliss. A quiet and tranquil resort, you can hear the waves gently lapping at the shore below. 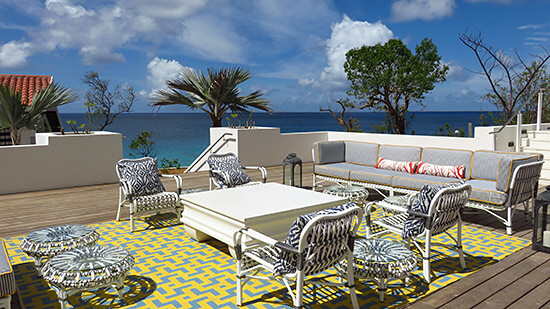 Malliouhana's location eliminates the white noise of gusty tradewinds and disorganized waves. 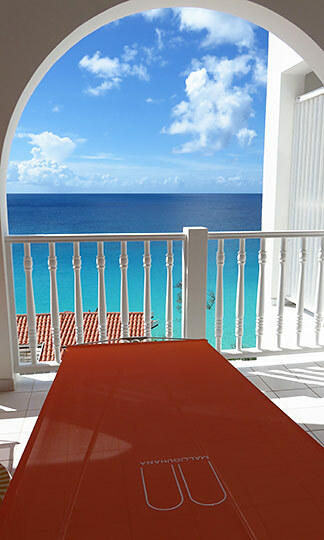 If you enjoy sheer silence between the perfect "shhhh" of rhythmic Caribbean waves, this is the place to be. I took one final look as we made our way back into the room. It is indeed breathtaking, and the all-white balcony accented with orange, modern chaises again creates an old meets new feel that is perfectly executed. Main hotel? Check. Bar? Check. Rooms? Check. Pool? Check. Beach? Check, check! But, what about dining? That was one part of the original Malliouhana experience that truly made it a cut above the rest. 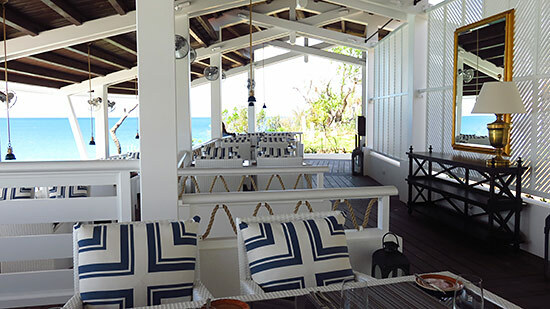 Malliouhana's signature restaurant, Cafe Celeste is one of the very best restaurants on the island, its menu established by Chef Jusman So. Chef Jusman lives and breathes haute cuisine. He joins Malliouhana from Southeast Asia, where he rose to high recognition, winning Singapore's "Best Rising Chef" award and establishing one of the most popular restaurants in the region. Chef Jusman specializes in an area that takes you back to the old days of Malliouhana, the days of Michel Rostang. 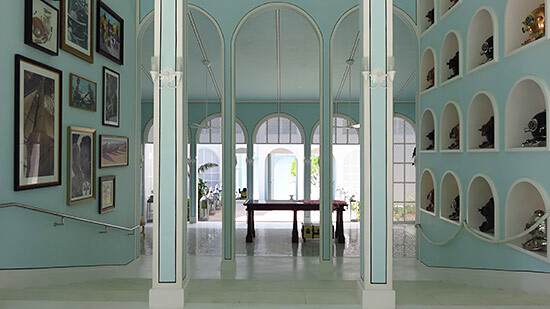 The Michelin star-winning chef, Chef Michel Rostang established Malliouhana as the destination for fine cuisine in the Caribbean when the hotel opened in 1984. Its menu? A French-Caribbean fusion. Today, those flavors and that level of cuisine has returned to Malliouhana. With that setting the stage, I was ready to see a menu. But first things first. What about the restaurant itself? 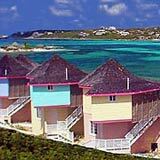 It has been entirely re-built and re-designed, remaining on its perch overlooking Meads Bay. In a word, it's perfect. We loved eating at the old Michel Rostang and this remake, like everything else I had seen so far, promises extraordinary new experiences. The use of woods is exceptional. 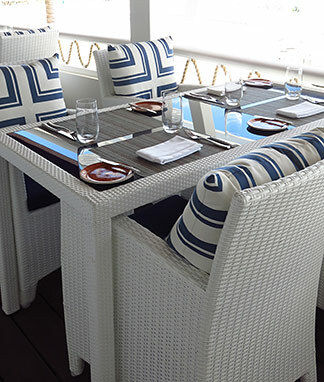 Dark hard wood on the floor and ceiling above, with white-wood chairs and navy-white pillows lends an elegant, nautical feel to the restaurant. The tables are tiered on three levels, each with that blue view. The top level gives you a 180° perspective of the restaurant and the sea below. The bottom level is the outdoor terrace area. It is expansive, wide and provides an up-close and personal look at the water below. 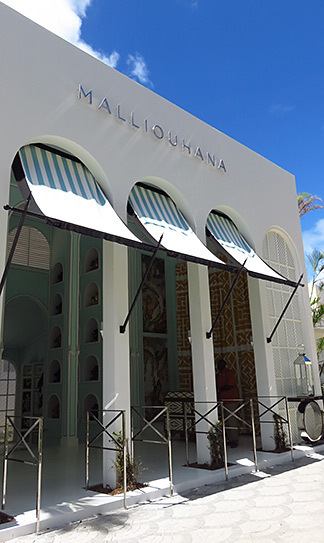 With Malliouhana's signature umbrellas placed throughout, it creates a special visual effect against the sky and sea. An immaculate job with design and construction! More on Malliouhana's restaurant, Cafe Celeste and Chef Jusman So. Update 2019: The dining concept below has changed. Full update on lunch at Malliouhana coming soon. First, they offer a number of wines by the glass, including champagnes, whites, rosés and reds. There is an excellent selection of classic cocktails and martinis, too. These include an "old havana" made with a 7 year old havana rum, prosecco, floral bitters, fresh mint and lime juice. 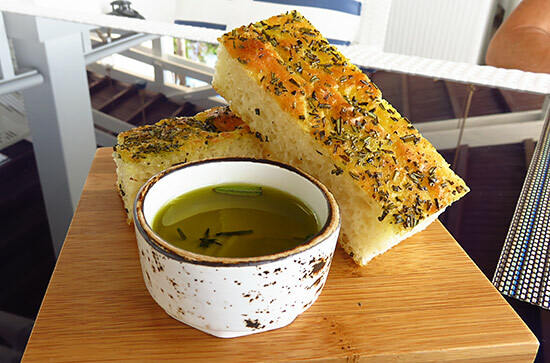 While we looked over the menu, our warm and accommodating waitress brought us a plate of fresh made focaccia bread. Their lunch menu is broken into three sections... "small plates," "a little bit larger" and "something sweet." Small plates include white gazpacho, whipped chickpea, kale salad, snapper crudo, tuna poke, tomato and watermelon panzanella and berkshire pork ribs. Larger appetites can enjoy a burger, jerk chicken burger, mahi mahi skewers, fish or beef tacos, conch/lobster pizza, sweet Italian rabbit sausage pizza and buffalo mozzarella pizza. Dessert features fruit skewers, guava panna cotta, "dark and stormy" (pirate rum ice cream with house-made ginger soda) and gourmet ice cream sandwiches (horchata ice cream with Mexican wedding cookie, passion fruit ice cream with chocolate crinkle cookie, salted caramel ice cream with brownie, oatmeal pirate rum raisin ice cream with gingersnap cookie). We started with the whipped chickpea. Lovers of hummus and olives, we had to sample this as an appetizer. Unbelievably creamy, without being heavy or the least bit chunky, I have never had such smooth hummus. And, the hint of lemon, topped with olives, gave it a zing that had us humming. The toasted pita? I could eat that all day. Puffy and crisp with just enough chew. My dining companion went with the kale salad for lunch. 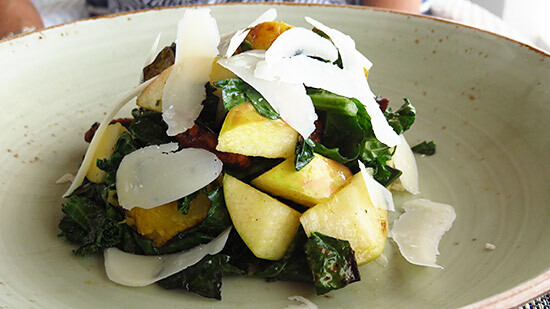 Grilled, it's mixed with spinach, pecans, dried cherry, parmesan and apples. Kale is in abundance in Anguilla. Nothing feels better than eating fresh. I decided upon the red snapper crudo. Fresh red snapper (caught in Anguillian waters) is served with mango and avocado in a gentle lime sauce and topped with jalapeno. Light and zesty, I highly recommend it. The focus of the lunch menu? Dishes that don't weigh you down, adding to the heat of the day. 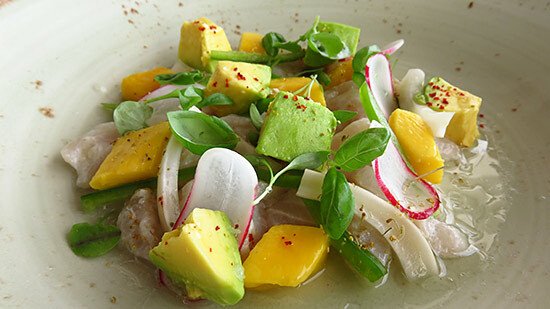 All of his dishes emphasize natural ingredients and their flavors. Less additives, less fat, more natural is his philosophy. It's a good one that works well. Dinner features a completely different menu and is accompanied by live music out on the terrace (or in the bar, depending on weather) on Wednesday and Saturday evenings. Beyond the beautiful resort and surroundings what else does Malliouhana offer? Free Wi-Fi, continental breakfast, afternoon tea and housekeeping twice per day. They also have iconic beach chairs down on the sand with a small watersports station. Kayaking, sunfish/hobie sailing, snorkeling and paddleboarding are all available without a cost. 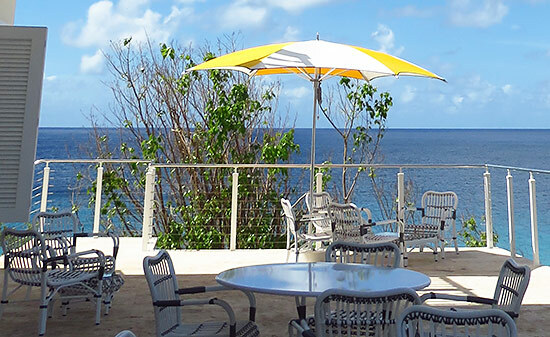 They will also begin serving food on the beach later on in the season, in addition to offering other various water activities (ex., boat trips to Sandy Island, etc.). 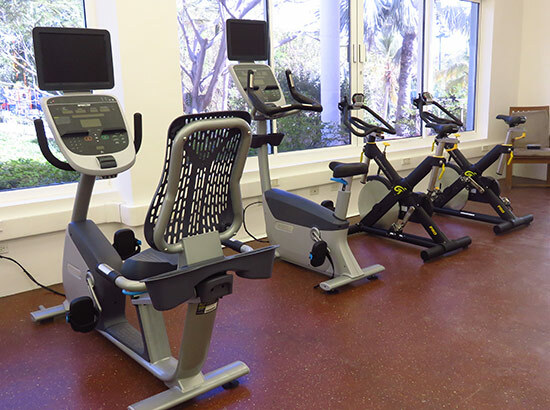 When it comes to keeping your body healthy, fit and feeling good, Malliouhana has a spa (moved to the back of the resort), a fitness center (with personal trainer), tennis courts, bicycles, a basketball court and a children's play area (the pirate ship is no more), too. 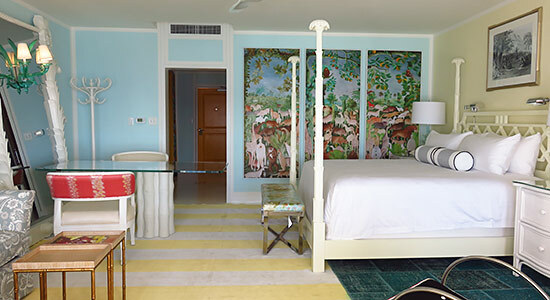 Malliouhana, an Auberge Resort has done it right. 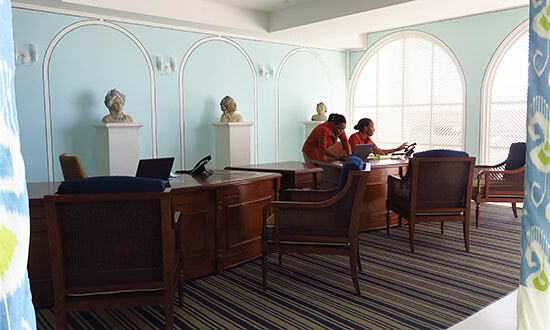 They have focused on the key areas of the hotel (structure, design and features of rooms/suites, dining, pool and beach, service) and struck a perfect balance between modern luxury and classic Caribbean. They have overhauled and polished to perfection. That timeless, classic elegance of the original Malliouhana, with its warm, tranquil, luxurious feel is brighter and more alive than ever. The Grand Dame is back on her throne. Rates start at around $400/night in the off-season, going up to $1,500 or so in-season, depending on the room or suite. For availability, detailed rates & to book, click here. 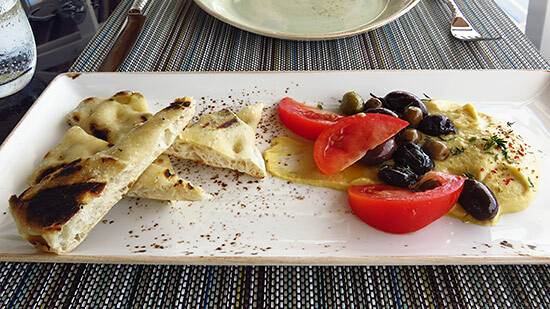 Malliouhana has now started serving lunch at The Sunset Bar. More on lunch at The Sunset Bar here. More on The Restaurant at Malliouhana here. It is inside the lounge area of Sunset Bar where the hotel holds their fine wine and aged rum tastings. An excellent experience, with Mr. Albert Lake as your host, it is not to be missed. More on Malliouhana's wine and rum tastings here. 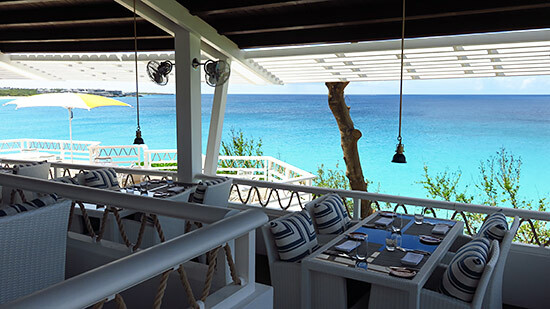 Every Saturday evening, Sunset Bar also hosts a beautiful weekly event, Rosé at Sun-Down, a cocktail party that celebrates Anguilla's stunning sunsets and a favorite wine, rosé. More on Rosé at Sun-Down at Malliouhana's Sunset Bar.